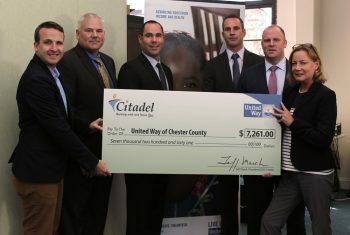 Kevin McDermott, David Layo, AJ Hiller, and John Kane of Citadel, and Claudia Hellebush of United Way. 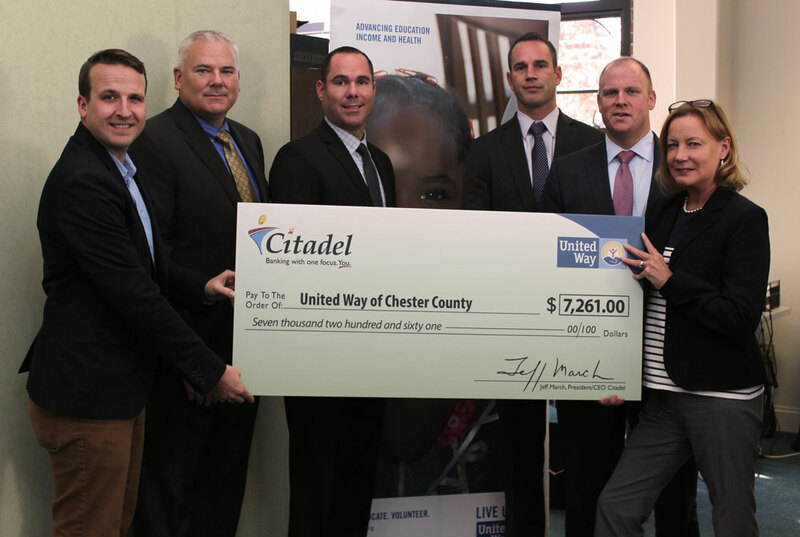 EXTON — Citadel announced its 2016 golf fundraiser, held at Honeybrook Golf Club, raised more than $7,200 for the United Way of Chester County. The company recently presented the check to United Way staff. Citadel’s annual event brings employees and their families together for golf and barbecue while raising funds to support the United Way. The goal of the fundraiser is to encourage employees to socialize and contribute to an important community cause. As a community-based financial institution, Citadel encourages employees to give their time and talent to assist corporate partner organizations or non-profits of personal choice. Through Citadel’s volunteer program, employees volunteer hundreds of hours to community organizations. The United Way of Chester County unites people and mobilizes resources to build better lives and stronger communities. The organization’s vision for Chester County is a community where all residents have the opportunity to achieve a vibrant and healthy quality of life.